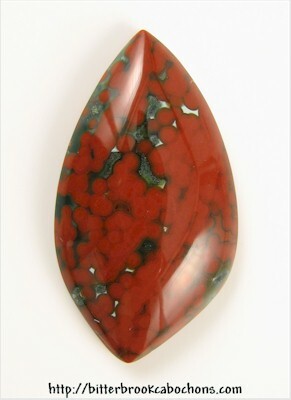 You don't see many Ocean Jasper cabs with red orbs any more; these colorful specimens wind up in collections or in vaults along with the gold! Lucky you, I just put this cab's brother in my collection, so you can have this one! 35mm x 20mm x 7mm; cab has a flat girdle. Weight: 30.75 carats. Do you like Ocean Jaspers? Click here to see all of the Ocean Jaspers on the site!